A black and white photographic postcard of the front view of All Saints' Anglican Church, Whitby. All Saints' Anglican Church was built in 1865-66 at 300 Dundas Street West on the north-west corner of Dundas and Centre Streets. This post card was created by Ontario County Souvenir, 1854-1904, printed by Keystone Press. Bottom of photograph reads: "ALL SAINTS' CHURCH, WHITBY". 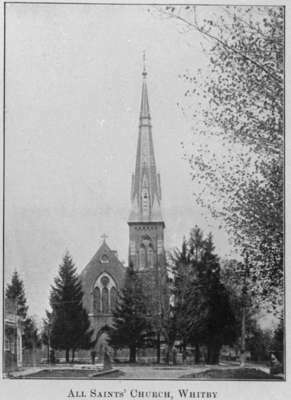 All Saints' Anglican Church, 1904, Keystone Press. Whitby Archives 09-002-002.